sold their homes, quit their jobs and returned here to live. or spiritual teachers and life coaches. Two world renowned organizations, one Buddhist and the other Taoist call Sarasota "home." There are so many spiritual classes, workshops, seminars, or meditation groups offered daily it’s like being in a spiritual all-you-can-eat buffet. In early December 2007 Jo Mooy had a series of dreams that gave rise to the Prism of LIght in Sarasota Florida. In the dream, Sarasota was identified "as one of 22 future Cities of Light." In subsequent dreams that month, I was shown a "map" which I recognized as SW Florida. Points were highlighted on the map. Each time a point was identified I circled the area on the map. I was told to "connect the points" and realized a "diamond crystal with facets" was emerging. A voice in the dream said, "This is not a crystal. It is a Prism. A crystal absorbs light. A Prism reflects it." The dreams continued to evolve nightly and in daily meditation more was given. I drew the connecting dots creating the Prism Diagram over a map of SW Florida (see below) then waited to determine what to do with it. One day in meditation the message was clear - "Gather 9 people to anchor the 9 points of the Prism at 12:00 noon on the Summer Solstice, June 20, 2008." Jo identified 9 anchors in the community who led spiritual groups or who were leaders of spiritual centers. Each responded immediately as though they too intuitively knew this was a momentous event. Each said they too had feelings that "Sarasota was a City of Light." 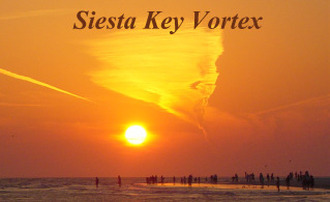 On June 20, 2008 between 12 noon and 12:24 pm (date and time directed by the dreams) gatherings were held across 65 square miles stretching from Anna Maria Island in the North to Warm Mineral Springs in the South and Myakka State Park in the East to the Vortex between South Lido Beach and Siesta Key Beach. Over 350 people joined across this expanse to set an ethereal Prism of Light over Sarasota. The Center of the Prism was a portal anchored by Shahabuddin, David Less and his group at Rising Tide Spiritual Center. the Prism of Light and the Spiritual Centers participating. Those Peace Poles were re-dedicated in 2014. (see below) The photo above is the Crystal of Peace Mandala that was created to identify the Prism, the participants, and the work done on the Prism of Light. Each color was meticulously painted in a sacred ritual by one of the Anchors. Then the Mandala was opened to the community participants who placed their prayers for Peace in the Mandala. It was blessed an imbued with markings by Singhe, a Tibetan Monk who served as Mandala maker for His Holiness the Dalai Lama. The Crystal of Peace Mandala now resides on loan to the Cosmic Center of Light in Sarasota. Those who settled here know they were called to a shared vision and a common purpose. Within days of arrival, they found like-minded people whose talents and skills complemented each other. Moving easily through the community, bonds were forged, alliances were created, and spiritual connections were made, forming a cohesive, spiritual wholeness in the community as though it had been fashioned from an invisible net. Many saw the city as a future ‘crystal city of light’ that was waiting to be birthed. 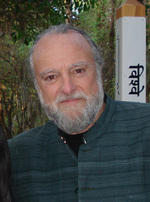 Two residents wrote poems dated 1993 and 2007 in which they described a “future city of light on the bay.” Their words and visualizations were complimented in books like The Keys of Enoch, Secrets of Amenti, and Calling Humanity which described Sarasota as a “sacred city of the new earth” or a “portal or stargate” city. In the beginning of 2008, from the world of ideas and dreams a Vision unfolded over the next six months, becoming clearer as time went by. The Vision from the unseen worlds and dimensions showed that a future-generation city of light would emerge. The city would be filled with love, light, healing, writing, art and music. The foundation already existed but the seed for Sarasota as a Crystal City of Light was to be planted on the Summer Solstice of 2008. It was to be one of 22 Planetary Crystal Cities of Light that would become light-beacons and sacred sites for the future generations of earth. 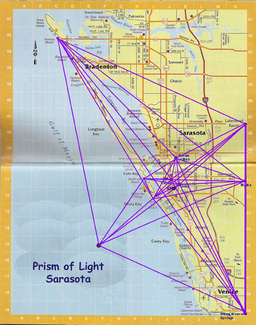 The Vision presented itself as an ethereal diamond-shaped Prism of Light over a map of southwestern Florida. The Prism outline stretched 65 miles from Holmes Beach in the North to Warm Mineral Springs in the South and 22 miles from Siesta Key Beach in the West to Myakka State Park in the East. The internal lines of the Prism aligned with different spiritual centers and temples which existed along a north-south axis. Each of the four points in the diamond (North, South, East and West) were determined to be locations of sacred sites that were important to the native people who lived on the land centuries ago. Within hours of releasing the map of the Prism of Light, those who heard about it in the spiritual community stepped forward to anchor or be part of the Prism. In an effortless process, friends, light-workers, and spiritual leaders declared themselves ready to participate in shaping this sacred Vision on the Summer Solstice, 2008. Across the miles, 222 people gathered at the four points of the diamond and all along the facets of the Prism at noon on June 20, 2008. Men, women and children gathered on beaches, in forests, in gardens and at seven spiritual centers. They held the consciousness that each of us was a Prism within the greater Prism. With bells, rattles, drums, and tonings, they proclaimed that each person present was a reflection of the light and love of the work each was called to do. They professed their intentions to seed the future City of Light in Sarasota where healing, teaching, alternative medicine, art, music, and writing would be guided and infused by spirit. Later that evening, under a Full Moon at Unity of Sarasota’s Labyrinth, 350 men, women and children, gathered to unite in sacred ceremony. 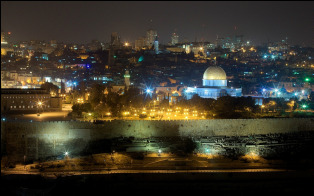 The multigenerational group in Sarasota united in fellowship with a group known as the Abrahamic Reunion holding a similar gathering that night in Jerusalem. The collective intention of the two groups was that a portal would be opened and anchored over the troubled city of Old Jerusalem while seeding a New Jerusalem. The New Jerusalem, one of the 22 Future Cities of Light, would be filled with hope, love, peace, and acceptance for all peoples. In sacred ceremonies at the Labyrinth, an Incan Despacho (thanksgiving prayer bundle) was offered to Mother Earth. In meditation, the group sounded rounds of OM which opened the Stargate of the Prism of Light, calling forth the 1000 years of peace, harmony and unity on earth promised by all the sacred teachings. And so it was! To commemorate the event - Peace Poles were installed at several points on the Prism of Light. The locations are: Rising Tide International, Unity of Sarasota, Sarasota Center of Light, Radiance of Sarasota and Warm Mineral Springs. An article in the Sarasota Herald Tribune covered the four Peace Poles that were installed at Unity of Sarasota, marking the four directions of the Labyrinth. They were donated by: Gerry Grieg, Sioux Warling, Patricia Cockerill and Jo Mooy. Click this link to see the article: Unity of Sarasota Peace Poles Dedication. 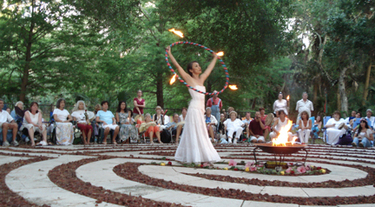 The spiritual community of Sarasota, along with the next two generations of children, seeded the Crystal City of Light on the Summer Solstice of 2008. 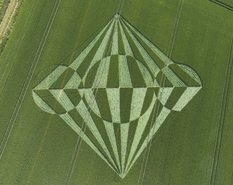 As we reflected on what we did, little did we know that just over a week later the Prism of Light would be validated by a Crop Circle which appeared in the wheat fields of Wiltshire, UK on June 30th. The circle mimicked the map design of the Prism of Light. The Crop Circle was a diamond-shaped Prism with facets and there in the center was the circular portal opening. Steve Alexander Crop Circle photographer and author of Crop Circles: Signs Wonders & Mysteries, in correspondence with Jo Mooy on July 6, 2008 confirmed the diagram of the circle matched that of the Prism of Light. Steve wrote in an email to Jo "No staggering news on this. Most people feel it is like a diamond ... perhaps you all instigated the appearance of this formation." As a founding member of the Abrahamic Reunion in Jerusalem, he orchestrated the Jerusalem gathering to coincide with the Prism of Light conducted in Sarasota the same night. The Abrahamic Reunion is a team of spiritual and religious leaders, men and women, Druze, Christian, Jews, Muslims, Palestinians, Bedouins, dedicated to building peace in the Holy Land and raising human consciousness. Climatologists have said that the southwestern portion of Florida, stretching from Tampa Bay to the Everglades is in a protected field called, 'the forbidden zone.' Meteorologists and scientists say the shape of the coastline of this area of Florida, the ocean bottom configuration, and the prevailing winds tend to create up-welling currents that take water away from the coastline. Some scientists have also said the Tampa Bay area is in a "bubble of protection." Based on a scientific study of 194 probes planted in the Gulf, the scientific reports indicate that this area was at "minimal risk of receiving surface oil." from the 2010 BP oil spill. Spiritual leaders in the community KNOW the area is in a "bubble of protection." When Hurricane Irma was on course to hit SW Florida in September 2017, the spiritual community held strong protective prayers for the area. The catastrophic storm veered east around the bubble of protection, leaving behind a heart shaped opening captured on film by weather newscasters. The photo on the left is the Heart-Shaped protection imagined by thousands in the spiritual community as Irma was heading for the area. The Siesta Key Documentary (Diamonds Along the Highway - Siesta Awakening) was shown on PBS WEDU and can be watched online. This special highlights the "other aspects"
​of Siesta Key beyond the sun, surf and beach parties.